If I were to enter the Witness Protection Plan a quick hack of Bed, Bath and Beyond's database would immediately reveal my new location. I move more often than anyone I know and those ridiculous blue flyers continue to find me! Their diligence is even more bizarre because I've never made a purchase at one of their stores - either on-line or in person. Fortunately this month's Body+Soul magazine has an article on curbing junkmail clutter (among other things). CatalogChoice.Org was highly recommended although labelled as a time sink. The author next visited 41pounds.org which estimates the average person receives 41 pounds of junkmail a year and charges $41 to cancel regional and national junkmail including credit card offers, coupons and insurance company info. Someone needs to reconduct this study based on how much junkmail 41pounds is nullifying and create a website called 19.99pounds.com. I'm not saying I would enroll in the program but I love healthy competition! lol...I know what you mean about the BB&B coupons!! 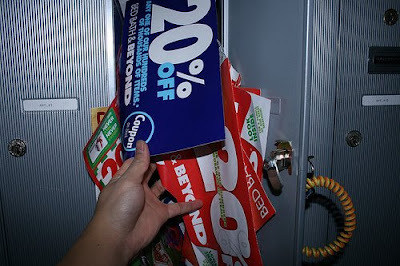 The funny thing about those bastards is that when we have 10 coupons lying around the house, I swear there's nothing I need from them. As soon as they've all been trashed and taken out with the garbage I always seem to find something I need there!! But then I hold off as I wait for another coupon....by the time it arrives I forget what I was going to buy, and so the cycle begins again. [sigh] Exhausting. You are so right about that! As soon as I chuck mine people ask if I have one around.